The Test Kitchen – Cooking Ideas for the hungry! Just because summer is leaving us, doesn’t mean you can’t stuff your face full of summer, all year long! Place 3 lbs of pork shoulder roast into a slow cooker. Cover the meat with the Aloha Mr. Hand BBQ Sauce. Cook the pork on low for 8-10 hours. To make the Pineapple Salsa, add the diced pineapple, diced sweet peppers, and cilantro into a bowl. Squeeze fresh lime juice on top and mix the ingredients together. For the Avocado Slaw, begin by mashing the avocados in a bowl. Add the coleslaw and mix until well coated by the avocado. 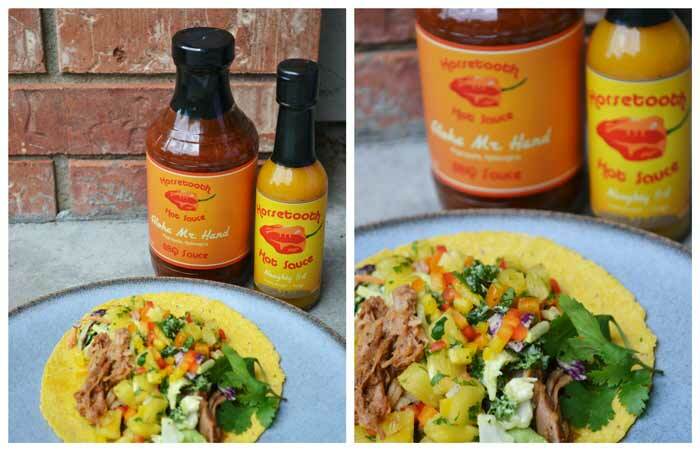 Serve the pork, Pineapple Salsa, and Avocado Slaw on a warm corn tortilla. For extra heat add some Naughty #4 Hot Sauce! The sauce really ties the food together! Recipe courtesy of Martin Wolfe.